Among those associated with Celtic football club who were sent parcel bombs last month was Paul McBride QC, a leading Scottish criminal lawyer, based in Edinburgh. McBride – who is known as a robust advocate – is a Celtic supporter but it seems that he may have been targeted with an explosive device by a loyalist organisation because he represented club manager Nigel Lennon at his recent ill-tempered Scottish FA disciplinary hearing. Other recipients of the bombs – none of which exploded, mercifully – included Lennon himself, plus a former Labour MSP, and a republican group based in Glasgow. It is perhaps not surprising that anyone deranged enough to send bombs through the public postal system might fail to understand the notion that an advocate should be seen as distinct from the causes he espouses professionally – however, passionately. But the Celtic case is by no means the first time that the crucial lines that mark the professional distance between lawyer and client have been blurred – sometimes by those who really should know better and with potentially deadly results. In 1989, Belfast solicitor Patrick Finucane died after being shot 14 times by loyalist paramilitaries as he sat down to dinner with his wife and three children. Finucane was a respected civil liberties solicitor who came from a staunchly Republican family. He had successfully challenged the British government in a number of important human rights cases and his murder came less than a month after Home Office minister Douglas Hogg complained that some Northern Ireland solicitors were ‘unduly sympathetic to the cause of the IRA’ – comments which were widely construed as referring to Finucane. Hogg’s comments appeared to ignore the fact that Finucane had also acted for a number of loyalist clients. With remarkable prescience, the SDLP’s Seamus Mallon’s immediate response to Hogg’s remarks was to warn that over-associating lawyers with their clients would put lives at risk. ‘I have no doubt there are lawyers walking the streets of the north of Ireland who have become targets for assassins’ bullets as result of the statement that has been made tonight,’ he said. 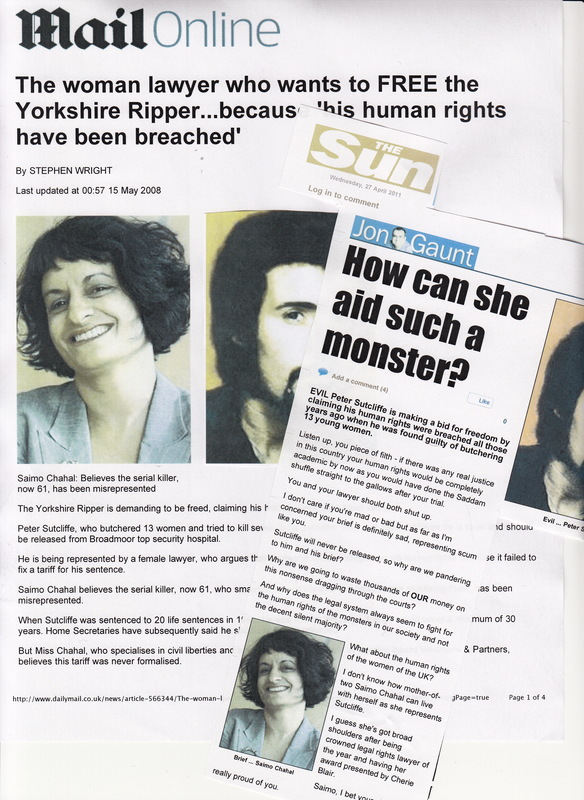 More recently, Saimo Chahal, civil liberties partner at Bindmans, was soundly monstered by the tabloids for having the temerity to act for Peter Sutcliffe, the Yorkshire ripper, in his attempts to fix a possible release date tariff. The level of vitriol (and misogyny) directed at Chahal for doing her job was unprecedented. The response to the coverage was predictable enough, with Chahal receiving hate mail and threats from as far away as Australia. As any good lawyer would, Chahal responded by insisting she would not be deterred from acting for other controversial clients (and her record since certainly suggests she has been as good as her word). However, other lawyers warned at the time that this kind of unprecedented media attack on a lawyer could only be insidious – particularly for those who don’t have the added buffer that comes with working at a large and well known law firm. Imran Khan, who specialises in defending terrorism suspects, warned that the fear of a tabloid mauling could make lawyers reluctant to take on unpopular cases. Khan made his name acting for the family of the murdered black teenager Stephen Lawrence, but has always been entirely clear that, in different circumstances, he could equally have ended up defending someone charged with Stephen’s killing. An adversarial justice system depends upon lawyers being prepared to act to the absolute best of their ability for even the most loathsome of individuals – and the distinction between the lawyer and their client they represent should never be forgotten or misunderstood. You wouldn’t expect a would-be bomber to care about such things, but the media and our political leaders certainly ought to – and should be sure to choose their words carefully in such instances.